Growth in the coworking movement is staggering. The Wall Street Journal reported Tuesday that WeWork is now the biggest occupier of Manhattan office space. Though impressive on its own, more amazing is the fact that the coworking movement is 100X larger. In that context, WeWork’s growth is only part of the story. Rather, it is serving as a proxy for the massiveness of the coworking industry. With such massive growth in coworking offices, what does this mean for companies, employees, and the future of work? This week, Stephen J. Bronner at Entrepreneur also writes about 12 crazy things you should know about WeWork. In the piece, Mr. Bronner reports that the company had 178 coworking locations as of November 2017. We thought it would be interesting to put that number in context with number of coworking locations worldwide. According to Statista, in 2017 there were 15,500 coworking spaces worldwide. WeWork’s locations only make up 1.1% of all coworking locations. Alternatively, for each WeWork there exist 99 additional coworking locations. In 2017, the number of coworking spaces worldwide was 15,500 and projected to be nearly 19,000 in 2018. Data sourced from Statista. 99 coworking locations for each WeWork. If WeWork is valued at $20 billion and represents 1.1% of locations, it follows that the value of the coworking movement globally is nearly $2 trillion. Granted there many factors which feed into a company’s valuation, but the growth curves of WeWork locations and the number of coworking locations globally follow the same trajectories. Choice. Choice. And more choice. Along with rapidly expanding number of locations, coworking operators are increasingly differentiating their products to cater to a variety of tastes and business needs. We see increased choice leading to increased pricing competition. But also, that operators are increasingly competing on building value-adds into their offerings. 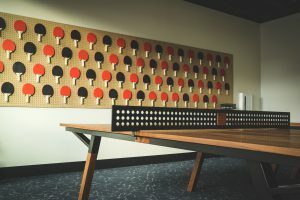 Artistry accommodates CTRL Collective’s high-end ping pong table amenity. Some operators pack their spaces with amenities and perks for companies who want to attract and recruit young talent. Others focus on cultivating an environment rich for business development by intentionally facilitating networking. While others build “business advice infrastructures” for their members by embedding an accelerator or incubator approach into their location. Others still, spare no expense on furniture and fixtures (think mahogany), creating an elegant base for high-end professional firms who want their space to amplify their company’s brand. In addition to a coworking office, Denver, Colorado’s Galvanize serves as a rich growth ecosystem with its code school and business incubator. 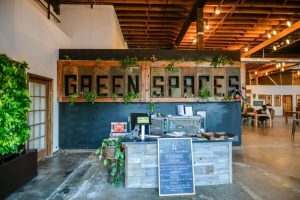 Green Spaces coworking is community-centric and exclusively houses organizations with “green” missions. Businesses begin by selecting coworking the category for its flexibility. However, now they also are shopping and selecting from immense variety within the category as well. Variety is a huge asset for a company to find the perfect physical space to amplify its business. However, variety also becomes complex quickly. More so, it is extremely difficult to navigate when information is scarce, fragmented, and lacking transparency; especially when it comes to pricing transparency and confidently knowing you are getting a fair deal. 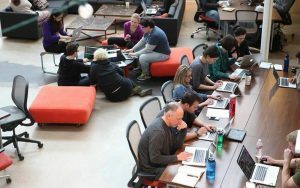 As the coworking movement continues to accelerate, tools and services to help businesses shop, compare, and easily get matched to the perfect coworking office — such as Upsuite.com — will be indispensable for decision makers. WeWork’s rapid expansion is only part of the story. They serve as a barometer for where the coworking movement is headed, but the movement as a whole is 100 times larger and about to create massive value for businesses and the future of work.